Eco Condos - Budget Friendly Apartments with lots of local wildlife visits! Our 2BR Eco Condos are the perfect vacation get-away for 1 to 4 or 5 persons, offering a lush, green, tropical view, sunny and spacious living quarters, 2 fully-furnished bedrooms with queen beds, AC in both rooms and ceiling fans throughout, a fully-equipped kitchen and a single bathroom. The apartments are located in a modern style building with plenty of on-site parking, along with a nice swimming pool and barbecue, located on the pool's deck. Included in the rental rate are national telephone service, Wi-Fi, cable TV, hot water, parking and bi-weekly maid service. The apartments are at a 5-10 minute walking distance to downtown Quepos where you will find local grocery stores, fruit markets, clothing boutiques, banks, pharmacies, and much more. 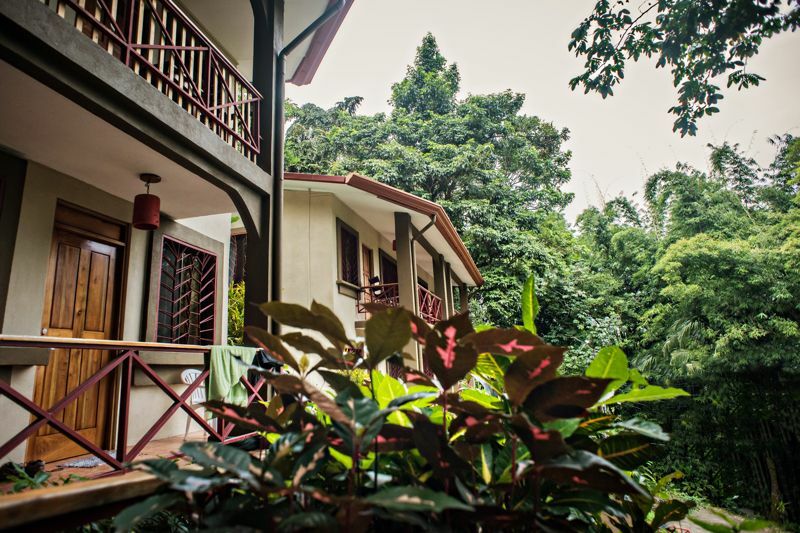 They are also located at only a few kilometers away from beautiful sandy beaches and the Manuel Antonio National Park." Our office / reception is located onsite and we are available 7am to 4pm every day to help you with anything and everything during your stay, including tour bookings, restaurant reservations, taxi service, or general info on the area! The apartment was very spacious and the pool a must have that time a year as it was very hot in Quepos. I wish I had picked a place with two bathrooms as it wasn't very convenient to have to wait for all of us (4) to shower before heading out to the many activities Quepos has to offer. The squirrel monkeys who come by everyday were so fun to watch! Angie was very helpful with restaurants recommendations and having a local phone in the apartment was very convenient. A drying rack would be a great addition. Overall, a great stay. Good location for both Quepos and Manuel Antonio Park. You can walk into Quepos or they will arrange a free ride to the Marina in the evening for you. It is a short way to the bus stop for Manuel Antonio. Everyone was pleasant and helpful. Communication ahead of time with Dorit was good. The kitchen was well equipped. Everything, except a hair dryer, was available. The bed was comfortable. Be aware that there is a very steep driveway to walk up and then a good number of steps. My shower was not good. With the glass doors shut, it leaked, a lot, on the floor. Also, the water ran hot, then cold, hot, then cold. Out of three taps only one worked. A little stick that had been inserted somewhere under a door fell out, then the doors wouldn't slide. I could have been trapped in there but managed to squeeze out a small space. Thanks for your review! We are so glad you enjoyed your stay with us and that you found our staff helpful during your vacation. I'm sorry to hear about the problems you had with your shower! I wanted to let you know that the apartments are being updated and worked on whenever we have gaps between reservations! We hope to have you back with us if you're ever back in the area. Pura Vida. The staff was great. Extremely helpful. Was fun to have while face and squirrel monkeys on the balcony. The iguanas life applies. Soda Sanchez great place for lunch. Bus transportation inexpensive. Thanks for the review Robert! We are so glad we got to have you here and that you enjoyed our accommodations and the local wildlife. We hope to have you back soon! Glad you had the chance to experience some of our Pura Vida!! Thanks for staying with us! I have stayed here many times over the years and I am never disappointed.The staff is great and very helpful.The location is awesome.The rooms are clean and spacious.The pool is great.Best of all the daily monkey visits.I truly love this place.Its my family's happy spot in the world. We love being your families happy spot!! Excellent location. The property was great. Dorit was super kind, an exceptional host accomadating everyone. We will return. Highly recommend! We look forward to your return and thanks for staying with us! The area around Manuel Antonio and Quepos is filled with opportunities for adventures. Manuel Antonio Estates will help you choose the best day tours and attractions, and make the arrangements for you. This could include hiking, biking, horseback riding, surfing, rafting, kayaking, mangrove tours by boat or kayak, scuba diving, sports fishing, going on guided National Park tours, Canopy tours (zip-lines), ATV tours, sightseeing, shopping, and choosing from the many many restaurants, bars and nightclubs. Manuel Antonio Estates is located within walking distance (5-10 minutes) from the town of Quepos where you will find all the commodities you require. Quepos is a busy little town where you will find all the services, souvenir shops, banks, pharmacies, bars and restaurants, supermarkets, and deli shops for your everyday needs. For music lovers, Quepos and Manuel Antonio offer live entertainment, salsa dancing and discos. We are 7km from Manuel Antonio Beach and National Park. It is about a 7 minute drive. If you don't have a car, there is the bus that runs twice an hour for around 50 cents. Taxis are approximately $2-$8 per ride. All tours and activities include round trip transportation from our homes. For those who wish to do so, car rental is another option. Rates are based on 2 guests; Add $15/night for each extra guest after 2.